Joel Cohen is a Grammy nominated cellist with a passion for unique, genre-bending music. Joel Cohen had his early musical training in the San Francisco Bay area with Irene Sharp and Margaret Rowell. After receiving his B.Mus. 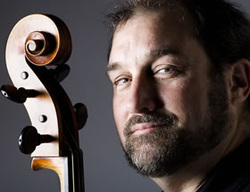 from the University of Western Ontario , further studies took him to Holland until his return to the San Francisco Bay area where he served as co-principal cellist with the Oakland Symphony from 1979 to 1985. Cohen lived in Vienna from 1985 to 1997 where he was a principal cellist of the Vienna Chamber Orchestra. During those years he also performed with the Vienna Radio Symphony (ORF/RSO), the Wiener Kammeroper, the Wiener Akademie (on period instruments), and Quartett Yggdrasil. He toured extensively throughout Europe and Asia with the Vienna Chamber Orchestra and the Johann Strauss Festival Orchestra of Vienna. After his move to Mendocino County in 2007, CA, Joel began producing concerts that showcase some of his favorite contemporary musicians (including Alastair Frasier and Natalie Haas (Spring 2010) and Oregon (Fall 2011). Joel also performs in the Boston area with "Improvelocity," a group which explores musical collaboration through spontaneous chamber music, creating works in various styles including jazz, fusion, soundscapes and world music.